The big news today, in my opinion, is Barack Obama's resignation from Trinity United Church of Christ, spurred on by last Sunday's hateful "sermon" by Father Michael Pfleger there. Why did Obama cut and run from Trinity now? Is he hoping that the apparent resolution of the Michigan and Florida delegate controversy tops the headlines--and the discussion on the Sunday morning talk shows? If so, I'm betting he's wrong. When the Pfleger rant went viral, I failed to see it's complete impact. For starters, I'm used to seeing the gadfly on the television news here, and I forgot how much of a novelty the blond Catholic priest who preaches like a black man is to those who haven't stumbled across media coverage of the longtime pastor of Chicago's St. Sabina Church. Along with Pfleger's onetime membership in the Catholics for Obama committee, and of course Pfleger's venue for his incendiary comments--the altar of Trinity United Church, the longtime roost of the toxic Reverend Jeremiah Wright, the recipe for another disaster for Obama was prepared for the voting public. Does this put the story of Obama and the "unashamedly black" church behind him. Obama might have to worry about the black vote now. Not a lot, but part of Obama's victory plan in November is to have a massive turnout of African-American voters that would put Obama over the top in the battleground states such as Ohio and Florida. Bush won 16 percent of the black of Ohio's black vote in 2004, and 13 percent of the vote in Florida. Obama will certainly do better than Kerry did among African Americans in those states, but will Obama now be thought of as a "sell out" to black voters? One month later, Obama disowned him. Last month, Obama disowned him, but praised Wright's successor, the Reverend Otis Moss, as "a wonderful young pastor." And it was that preacher who introduced Father Pfleger, a popular man among Chicago African Americans, to the parishoners at Trinity United Church last Sunday. As for black voters, Obama will have some explaining to do. Even for a Democrat, he'll still win an astoundingly high percentage of the African American vote. But how many will stay home on Election Day? CNN breaking news: Barack Obama has resigned as a member of the Trinity United Church of Christ in Chicago, his campaign says. Hat tip via e-mail to ThirdWaveDave. Tupelo, Mississippi's claim to fame of course is that it is the birthplace of Elvis Presley. That's the house on the left, where The King was born on January 8, 1935. Tragically, Elvis' twin was stillborn. What you see is a tiny home, it's only a little bigger than the public area of many convenience stores. There are just two rooms. Elvis' father, Vernon built the home, with the help of his father and brother. Like any home of a famous person born poor but who found fame later, the furniture in the home is not original, but is typical of what you'd find in a house of the 1930s and 1940s. Like most southerners at the time, black and white, the Presleys were poor, worked odd jobs, but found solace in religion. There's a chapel on the grounds of the birthplace, something Elvis said he wanted there shortly before he died. Elvis was a committed Christian, and it's often forgotten that he recorded many gospel songs. When the rock pioneer succumbed to a heart attack in 1977 at his Graceland Mansion in Memphis, he was reading a book about the Shroud of Turin. As for the house, the Presleys couldn't make the payments on it, and were forced to move next door into the home of Vernon's parents. 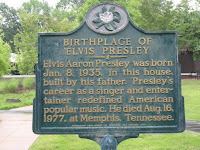 The family lived in several other homes in Tupelo, before moving to Memphis in 1948. Somehow I missed the museum, which, and I still can't believe it, I overlooked. (Next trip I need to have either one of the Marathon Pundit family members, or a blogger with me.) I thought the gift shop and the museum were the same, and besides, I purchased an appropriate Elvis gift in downtown Tupelo, which I'm going to cover in my next post. I know I'm skipping around a little bit, when you read that entry, you'll know why I chose to cover the birthplace first. 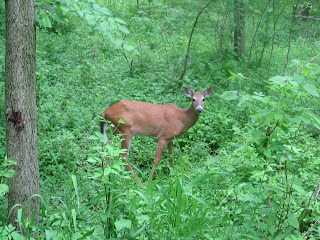 This is the young buck I encountered during my 10 mile run this afternoon; he was chowing down on whatever deer eat in the Linne Woods Forest Preserve in Morton Grove. For those people who came to this blog seeking information on the rapper Young Buck, click here. We've had a lot of rain lately, as the greenery in the picture shows. Thank you Michelle Malkin for once again linking to Marathon Pundit. 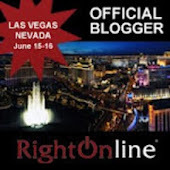 My Coincidences and the Las Vegas Rezko arrest warrant, filled with Chicago political intrigue, can be found by clicking here.